Depending on the season, Rich Alday could be found wearing either a football or baseball uniform during his days at Tucson High School, where he was All-City, All-State quarterback on the 1965 State Championship team. Later, at Emporia State College, he was named All-City, All-State catcher and received an All American honorable mention during the 1969-70 season. Later still, Rich was assistant coach and a member of Team USA, taking the baseball Olympic gold medal in 1998. He also spent some time in the majors with the Washington Senators. For sixteen years, Rich polished his coaching skills at Pima Community College, where he was named Coach of the Year in 1981, 1983 and 1985. A longtime member of the American Baseball Coaches Association and the U.S. 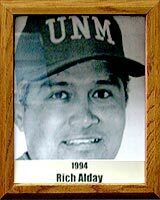 Baseball Association, Rich has been Head Coach of the University of New Mexico “Lobos.” In 1991, he was chosen Western Athletic Conference (WAC) Coach of the year.